Holds up to a 10 lb. Poultry or roast. Will Fit two whole chickens or small to medium turkey. 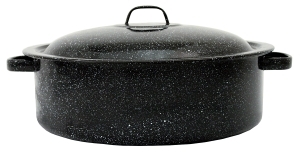 No Shipping Available of Pots,Pans and accessories outside of the United States due to High Cost of shipping Single Items which would triple your price...sorry! Large 5 qt. for extra cooking capacity. Will fit into the Global Sun Oven, All American Sun Oven, SunFocus, and SunCook, solar ovens. Too wide for the SOS Sport Solar cooker. Will fit most any homemade or commercial panel or box cooker. 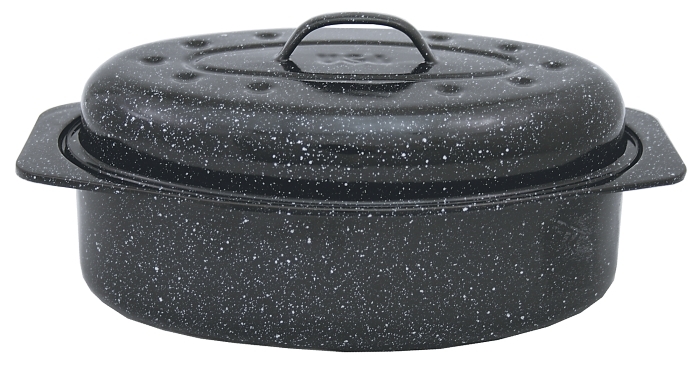 Great for cooking dry beans and anything else you wish. 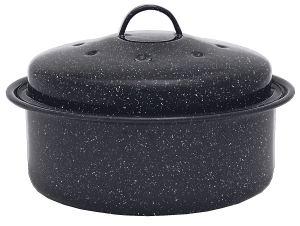 Narrow and Deep pot ideal for cooking items fully covered in their natural juices. Will fit into the Global Sun Oven, All American Sun Oven, SunFocus, and SunCook, solar ovens. Great for panel cookers as well. Fits the SOS Sport with lid inverted. Should fit most other custom built homemade solar panel and box cookers. 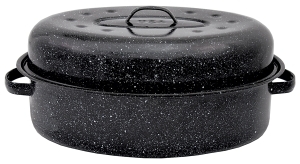 Great for cooking small poultry and anything else you wish. Whole chickens can fit easily. 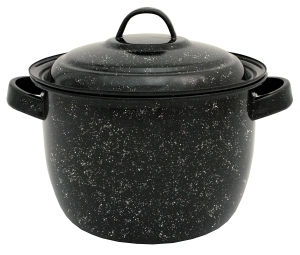 Great for stews, soups, cakes, casseroles etc. A whole chicken can fit easily. 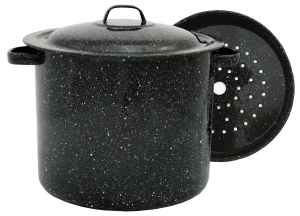 Great for stews, soups, chili etc. Two Fit the Solavore Sport side by side. 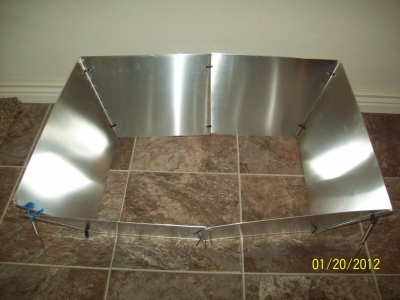 Should fit most other custom built homemade solar panel and box cookers such as the Copenhagen Solar Panel Cooker. Can be used in all solar cookers and ovens. Recommended for the Haines 2.0 Solar Cooker. 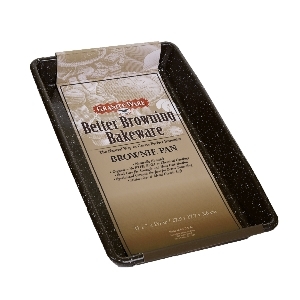 Great for solar cooking lasagna, enchilada, casserole and even cakes, cobblers and even as a cookie sheet. 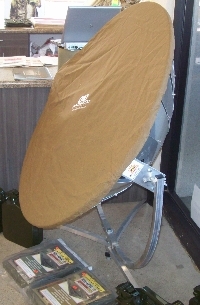 Use for solar cooking bread, cakes, meatloaf, casseroles etc. Dark color will reduce bread cook time and help to brown your white and wheat bread. Will fit Global Sun Oven, All American Sun Oven and Solavore Sport Oven, SunFocus and SunCook Solar Ovens. Small enough for any of our solar cookers. This one will fit the Global Sun Oven, All American Sun Oven, SunFocus, SunCook and Sport Ovens. 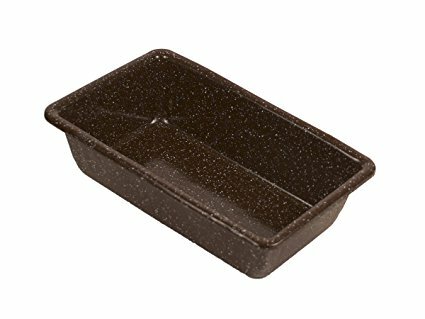 Cookies, sweet rolls etc., bake faster on this dark colored surface. 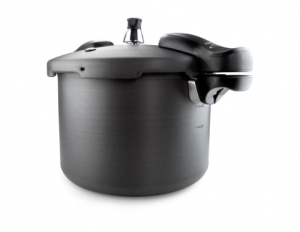 Speeds up cooking process, greatly reducing the time to cook. 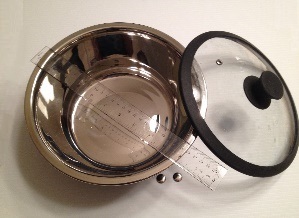 For use with a high temperature parabolic cooker, will not work as pressure in a solar oven or panel cooker. Will work with a quality rocket stove. High-performance, non-reactive, hard anodized aluminum. Independent release valves prevent over-pressurization. Diseases that are spread through contaminated water cause 80% of illnesses in the world. Heating water to 65 C or 149 F(Fahrenheit) makes it free from disease organisms, such as germs ,parasites, cysts, and viruses-so it is safe to drink. This process is called pasteurization. If you put a WAPI in water when you heat it, it tells you later if the water has been pasteurized -even if the water has already cooled. The WAPI is a sealed tube with special soy wax inside that melts at 149 F. Melting of the wax is actually a little above pasteurizing temperature after the heat penetrates the tube. The WAPI is ideal for use with a solar cooker. Reusable, long lasting and compact. Can be used to test pasteurization levels of water any where you may be, using any form of heating, even over open fires. Great for the outdoors man and preparedness specialist.